Next up for Black History Month is Ann Lowe (1898-1981), designer to prominent families such as the du Ponts, Roosevelts, Vanderbilts, Rockefellers, and Bouviers. 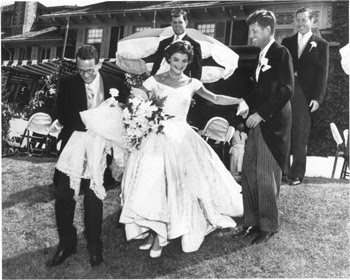 Lowe is most famous for designing Jackie Kennedy’s wedding dress. …took 50 yards of silk taffeta and more than 2 months to make. Lowe’s career began with the death of her mother when [she] was 16 years old. 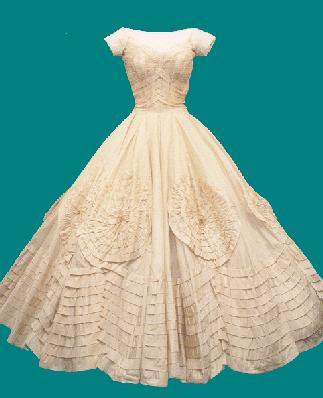 At the time of her death, her mom, a seamstress, had been working on four ball gowns for the wife of Alabama’s governor. Lowe finished the work her mother had begun. Afterward, she moved to New York City to attend the S.T. Taylor Design School. Returning to Tampa, Fla., after school, Lowe operated her own dress shop before going back to New York to work in fashion salons. Although her creations did well, the salon owners always got the credit. Finally, Lowe and a partner opened their own shop in New York. 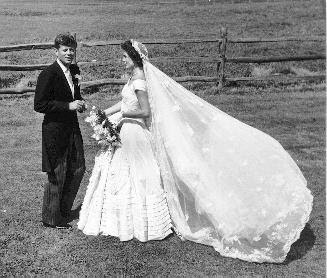 It was during this time that a young Jacqueline Bouvier asked Lowe to design all the gowns for her wedding to Sen. John F. Kennedy, a man who later would become president. A flute of champagne to the memory of Ann Lowe! * Today is day one of Fashion Week. A ton of shows are going on, including Yigal Azrouel, BCBG, Nicole Miller, andâ€¦drumrollâ€¦Baby Phat! Yeah, well, I only have one invite for today, to Marc Bouwer. Iâ€™m excited to go to the tents, no matter what the show.